I’ve always been obsessed with mythology and the way we tell ourselves the same stories over and again in different ways. I suppose it is the way that myths encourage retelling and augmenting until they have their own lives that fascinates me, though in saying that, storytelling in all forms has always been an interest. Yggdrasil - as a setting and a character - is a completely intriguing myth, not least because of its unusual focus on creation and recreation. Our knowledge of Norse myth is rather sketchy, as we don’t have many first-hand accounts, which has shifted the way we read and understand them. What we do know, however, is that a lot of Norse mythology is known to be about destruction and the end of times, and the absence of that devastation is something that attracted me to Yggdrasil, The World Tree. 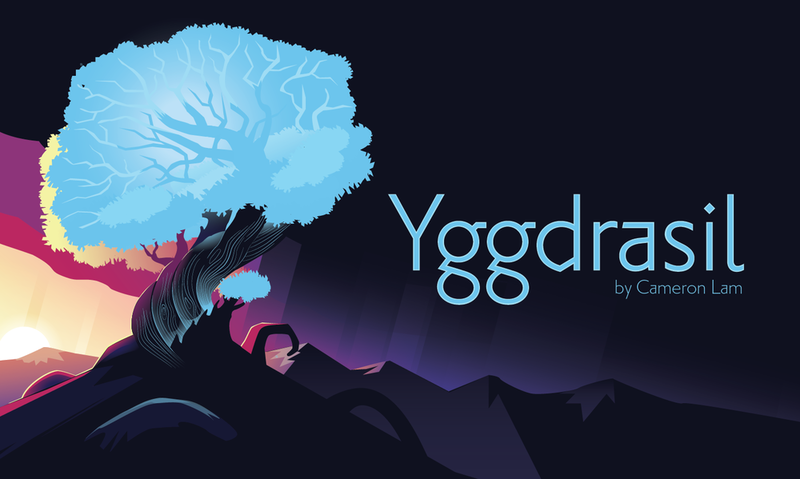 This piece is definitely the most programmatic work I’ve ever written because I’m trying to capture the lifespan of Yggdrasil, which is basically a representation of the entire universe! Everything falls easily within the boundaries of this story, beginning with creation and ending in the rebirth after destruction. I love that this character is born in the void between worlds of fire and ice, between chaos and stasis. It lends itself to so many tie-ins with the universe and the earth. Throughout the piece there are snapshots of birth, of side characters and different settings, and, perhaps most importantly, of what happens after the universe is destroyed. Out of the ashes comes humanity: a new world and a reborn Yggdrasil. I don’t think it is a coincidence that this piece and the concerto I wrote most recently, Electric Phoenix, are obsessed with the idea of rebirth. The concept is really interesting and also problematic, and composition is a very selfish form of therapy, I suppose! I like using my writing to explore large, daunting prospects and questions: how do you stare down death and cataclysm, (or a bleak looking present) and survive? Long form works really require a story and a narrative, and musings on life often come to form a part of this. When I’m teaching, I often tell my students that writing short form works is kind of like learning to build a dog house. They’re self-contained and there are a finite number of ways to put the base together. When you want to build a big house, a real house that you can actually live in, you can’t just build a bigger version of the dog house, and you also can’t just join a bunch of dog houses together. It’s a completely different foundation. When I’m writing a short work, I think about how that in 3-5 minutes, I have time to explore one musical idea. It is an opportunity to work through something technical, a pattern perhaps or a theory that I’d like to try – basically, it gives enough space to explore a singular concept. For this reason, when I’m working on a smaller work, I feel like I can start from a single motive or idea and work organically. If I try this in what will be a long-form piece, the idea tends to peter out or begin to ramble, so I like to begin with structure. The first notes of Yggdrasil were written at the Melbourne airport when I missed my flight and suddenly had four hours to kill with nothing but coffee, a sandwich and a bunch of manuscript paper. I had the idea to write this huge mythological concept and so I just started plugging away, thinking about how to transcribe all the ideas I wanted it to get across – I mean, where do you start on writing about fire, ice and a tree that happens to represent the universe? Those four hours turned out to be the most productive hours of last year! I used to write every day and I still really love the idea of that as a method, but realistically, I have a full-time day job and a million other things that I am responsible for, so it’s not quite possible any more. I think I am lucky in the sense that I need to write – if I go a couple of days away from the manuscript it’s okay, but if it goes a week I become a grumpy human and the act of writing actually improves my outlook. I think about composition every day and I think that has become a big part of my creative process – I plan pieces and begin to sketch ideas while I’m sitting on the bus. There are pieces I’ve written five or six years after I first thought of the idea and I think, because of that time I spend stewing over the musical possibilities, pieces are often structured in my head almost completely before I even get a pencil in my hand, so they don’t take that long to get out! It’s tricky in a way, not being able to partake in a kind of daily practice, but lots of studies on athletes show them running their race better if they’ve gone over it in their mind before physically getting onto the track, so I think my current system is okay! I feel like if I get a lay of the land in my head before I sit down to write I have a much stronger idea of how it’s going to happen. I do think I’m a better composer for all the things I do that aren’t composition. I’ve been running Kammerklang for years and that business has itself gone through a bunch of guises – a production company, a new music ensemble, a record label… I’ve run rehearsals and gigs and there’s something wonderful about having those experiences and getting to know how the other side of the performance coin works. It gives you a great feeling as a composer of the messy reality on the other side of the beautiful abstract that we generally work in. I think I’m much more willing to engage with and trust my performers because of these experiences – now I leave spaces open in my music and I’ll write fewer markings if I know someone particularly well. Being able to let the performer express the music in their own individual way is extremely powerful. This particular process has been really exciting: the instrument, which is not used that often, sits at six feet tall and sounds two octaves below the Bb clarinet. I was a bass clarinettist in high school and when eBay was in its infancy I bought myself a contra for $3,000 which felt like all the money in the world back then! It is a beautiful instrument though, and I have spent a lot of time playing it (albeit rather badly). The contrabass is a really expressive instrument that has a surprisingly nimble range: it speaks really quickly and moves well. Sue Newsome and the Sydney Conservatorium's contrabass clarinet. The piece that I’m working on for Sue Newsome and the Sydney Conservatorium Wind Symphony (under the baton of John Lynch), stems from two earlier commissions, also based on trees: first, Jacaranda, and second, Eucalyptus. When I was considering how to write a piece that sounded representative of the biggest mythological tree in the world, I knew I had to write for a bigger instrument. Both the contrabass clarinet and Yggdrasil have a gravity to their characters, so the fit has worked well. I love that the contra has such a large and textured range – there are heavy low rumblings at the bottom, then as you climb up there are hints of saxophone and oboe. It’s a timeless sound, as Yggdrasil is a timeless myth. I think it’s crucial that young composers know that it’s up to each of them to define what their career will look like. It’s so easy to look at what your lecturers have done, which of course is important and valuable, but you have to look at what you value to really figure out what your career will look like. It’s also important to give yourself growing space. A long-time ago, I stopped referring to pieces I was taking to performers as “finished”. Now, until my piece is performed, I call it a draft. That means that the composition process doesn’t stop with the double barline, and it makes going into those first rehearsals a lot less confronting. It will always be scary – taking your works to players for the first time – but knowing that you have the space to change the notes on the page is quite freeing. There’s no right way of doing things, and you should always be learning. Honestly, the big failures are the best! My favourite bit of advice is that there’s nothing wrong with making mistakes as long as you try not to make the same one twice. The Sydney Conservatorium of Music Wind Symphony perform Cameron Lam's Yggdrasil: The World Tree as part of the "Of Nature and Humanity" program on Thursday 24 August at 6:30pm. More information available here.